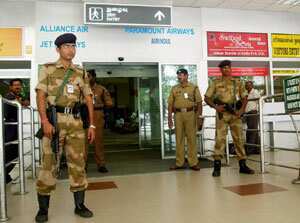 New Delhi: A week after the terror attacks in Mumbai, India put airports in Chennai, New Delhi and Mumbai on alert, fearing that terrorists would hijack an aircraft and effect a 9/11-style attack that brought down the twin towers of the World Trade Center in New York seven years ago. The heightened security at the airports, a bomb hoax at a New Delhi court and a partial suspension of fishing activity in Gujarat are representative of how fears over another terror attack could disrupt life and business. There is a perception that higher spending on security and lower productivity and sales could hurt companies at a time when the economy is beginning to slow. “Earlier, there were all these fears about health and security. I think this year, as a general trend, people had become more complacent about doing business in India because they have been coming here for a while now. That’s certainly been the case until this weekend," said John Henderson, country manager for risk management consultancy Hill and Associates Ltd.
Henderson added that his firm had received at least 15 “genuine enquiries" since the Mumbai attacks. Saturday, 6 December, is the anniversary of the demolition of Babri Masjid, a mosque in Ayodhya, by a Hindu mob, and analysts say there are concerns that terrorists could strike on that day. On Wednesday, in a meeting with India’s army, navy, and air force chiefs, defence minister A.K. Antony warned of 9/11-style airborne attacks. On Thursday, the Tis Hazari district courts in Delhi suspended work for the day after a bomb hoax. And news agency PTI reported that many fishermen in Gujarat are unwilling to venture into the sea. The Sir Creek, off Gujarat’s coast, is where terrorists involved in last week’s attacks are believed to have commandeered a trawler. “There was additional frisking inside the airport, besides insisting on a recent photograph to prove photo ID. There was further frisking just before getting into bus at apron", said Munaf Patel, who was flying to Ahmedabad by GoAir. A senior official with budget carrier SpiceJet said the airline was seeing cancellations that were 1-2% above normal for passengers scheduled to fly on 6 December. The official, who did not wish to be named, said the airline was not contemplating combining or delaying any flights on that day, however. “There is a cost associated with that (responding to hoaxes)," said Rajan Bhagat, assistant commissioner of police and spokesperson for Delhi Police. “But the bigger cost has been the number of cases that have been deferred." The Delhi Police gets about 3,000 calls a day; in the past year it has received 100 calls relating to bomb hoaxes. While it is difficult to calculate the economic cost of terror threats, industry lobby Associated Chambers of Commerce estimates that the security industry which has been growing at some 25% over the last five years will see exponential growth and double in size to Rs50,000 crore in the next four years. Major ports across the country will need to invest in basic equipment such as container scanners, while airports such as the one in New Delhi are also increasing security measures. “The basic requirement would be two container scanners per port, each of which costs around Rs2 crore. Then we also need to upgrade the presence of the Central Industrial Security Force (CISF) and the Coast Guard at these ports and the littoral waters, respectively. All of this would put the cost band for improving security at around Rs100 crore," said a shipping ministry official who did not want to be identified. “There is a cost attached to increasing and improving the security apparatus, but there is no case of escaping it. We are doing a lot of things but I would not like to make it public," said R.S. Sharma, chairman and managing director of Oil and Natural Gas Corp. Ltd.
Sarthak Behuria, chairman, Indian Oil Corp. Ltd, India’s largest oil marketing and refining company, said: “These (intensifying security operations) are mid-term and long-term efforts. We keep on doing it. Our business is such that we need to constantly intensify and upgrade our security apparatus. We have CISF and other agencies to take care of our installations such as refineries, terminals, depots among others. The increase in costs will be borne by the company. But these are something internal to the organization." “The cost to corporate clients will inevitably go up. Most of them will beef up security systems be it doubling their guards, asking for armed guards, moving car parks (further away from building) or screening of employees," Henderson said. The Indian Railways proposes to invest an additional Rs600 crore in improving the security in the metros of New Delhi, Mumbai, Bangalore, Kolkata, Chennai and Hyderabad. At present, it spends Rs80 crore every year on securing these railway stations. The money will be spent on installing closed circuit televisions at all stations and increasing the security manpower at platforms, said a railway ministry official who did not want to be identified. “(In addition) each zonal railway concerned is also drawing up its own security plan which will look at integrating the best technology available in monitoring people moving about at railway stations." Utpal Bhaskar, Malathi Nayak and Tarun Shukla of Mint, and PTI also contributed to this story.